Gooey, Rich, and Super Chocolatey Triple Chocolate Brownies! 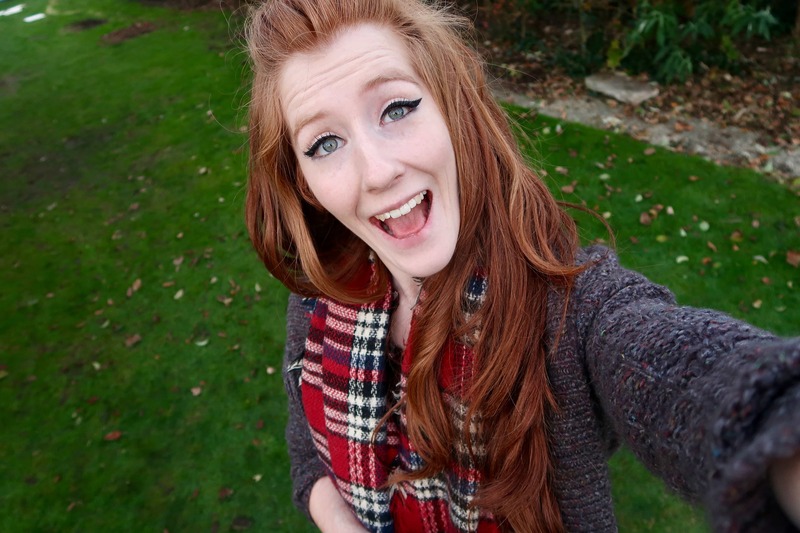 So, I thought I would start a new ‘series’ on the blog – Back to Basics. 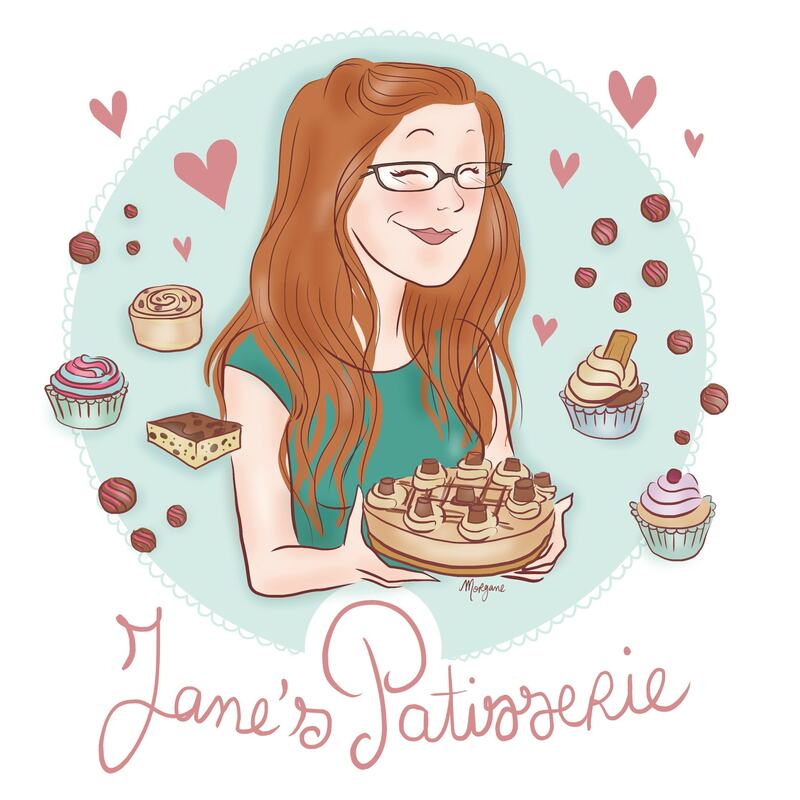 This is because I have a lot of themed or flavoured bakes on my blog, but some of the actual basics haven’t been covered. I technically have a Triple Chocolate Brownies post on my blog, and these Brownies are the exact same, but they’re my Christmas Tree Brownies. I thought it would be best to do a fresh new post for these beauties! The Back to Basics series will literally cover the basic of baking recipes… traybakes, cakes, cheesecakes etc, but as I was in the mood for a super chocolatey flavour, I thought Brownies has the best place to start! Also, my boyfriend has been bugging me for a good while now to make a batch of these, so I thought I would oblige to keep him sweet. I make my brownies in a particular way, as for years and years I struggled with brownies. There are so many different methods out there, and I often found that they took far too long to bake. 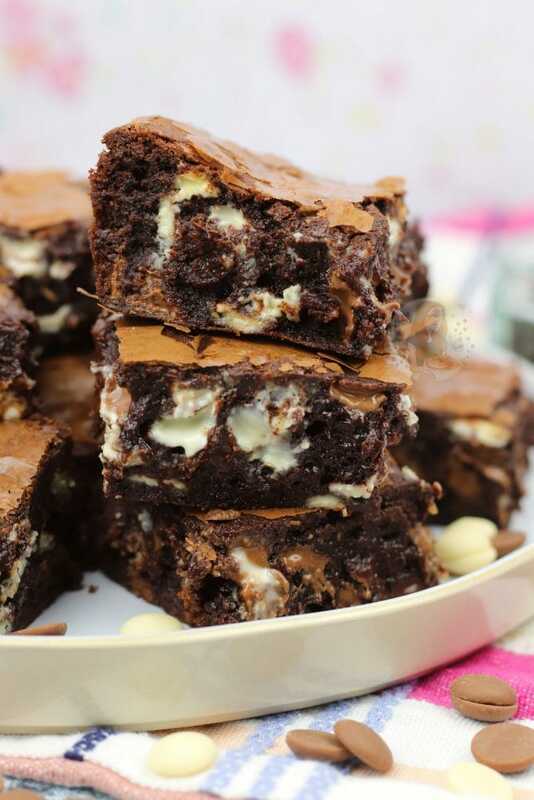 As long as the brownies have got hot, the gooeyness doesn’t really matter and its not going to kill you, so no brownies were ever harmed in my experiments. 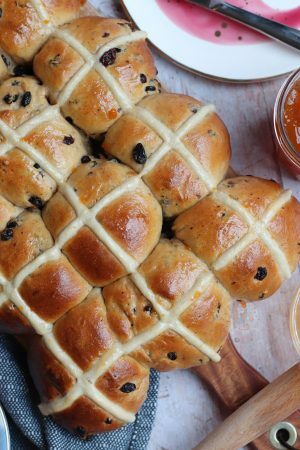 Often, I used to use a recipe that briefly mixed the butter, eggs and sugar so the mixture itself was completely different, but after trying out a few recipes such as the BBC Good Food recipe, I much preferred the whisking technique. When you put the whisking technique side by side with a different one, I often find you can even just see the differences. The look, texture and more. I much much MUCH prefer this whisking method. With this method, you basically whisk together the eggs and sugar to a really thick mousse, and its what gives the brownies their texture. You MUST whisk them for basically a really long time until the mixture is much much paler, thicker, and more than doubled in volume. If you briefly mix, it probably won’t work as well. Also, when you then mix the rest of the ingredients, mix them BY HAND so you don’t deflate the mousse. I like 99% of the time use my Stand Mixer for these kinda thangs, as I find it SO much easier, but I get that not everyone has a stand mixer. You can also use a simple electric hand whisk, and its 100% worth it. If you’re in the UK, you can get a basic hand mixer for under £15, and even cheaper in some other actual shops, and this makes baking so so much easier. Even with a hand mixer, you can get the texture you want. It might just take a smidge longer, but again… you’re going to save your arm and probably your brownies! When you fold the melted Chocolate/Butter, and Flour/Cocoa Powder into your egg mousse mix, you want to be as careful as you can, because if you go and beat it all in you might cause your mixture to be too runny. I can often get comments saying that peoples brownies are taking far too long to bake, and thats down to the mix. People can say they followed the recipe “to a T” all they like, but something went wrong. 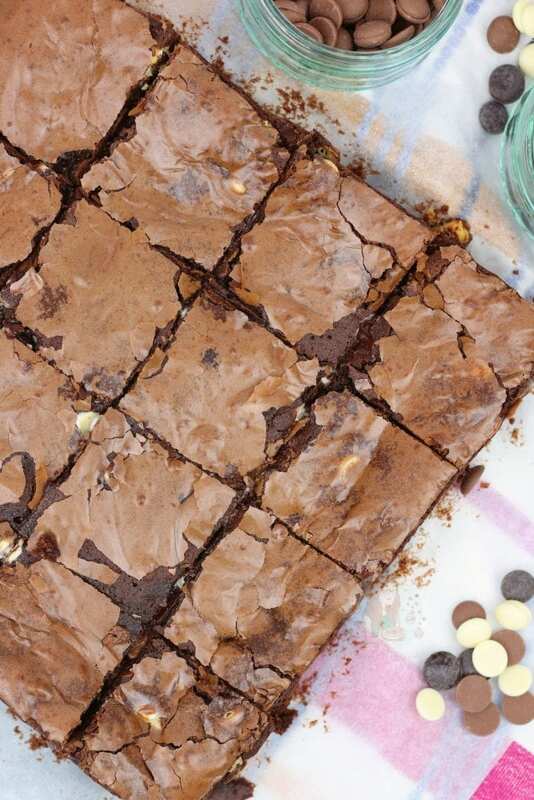 It can be down to ingredients, but usually… its the mix with brownies. Too liquid, not mixed enough, etc. For the actual Chocolate Chips in the recipe, you can use supermarket own chocolate, cadburys chunks, galaxy etc… but I wouldn’t make them too large. For the ones in the pictures, I used Callebaut Chocolate Chips because I love them, but equally I often use Tesco’s own Chocolate bars that come in at 45p per 100g of chocolate. This is obviously cheaper than cadburys which can often be £1 per 100g. HOWEVER… for the base of the brownie mixture, YOU MUST USE DARK CHOCOLATE. No, you can’t taste it like a chunk of dark chocolate, it just makes it so fudgey and delicious, and it naturally sweets so you do NOT need to worry. Once combined well, fold through the chocolate chips and pour into the prepared tin – bake in the oven for 25-30 minutes! Once baked, leave to cool in the tin completely. 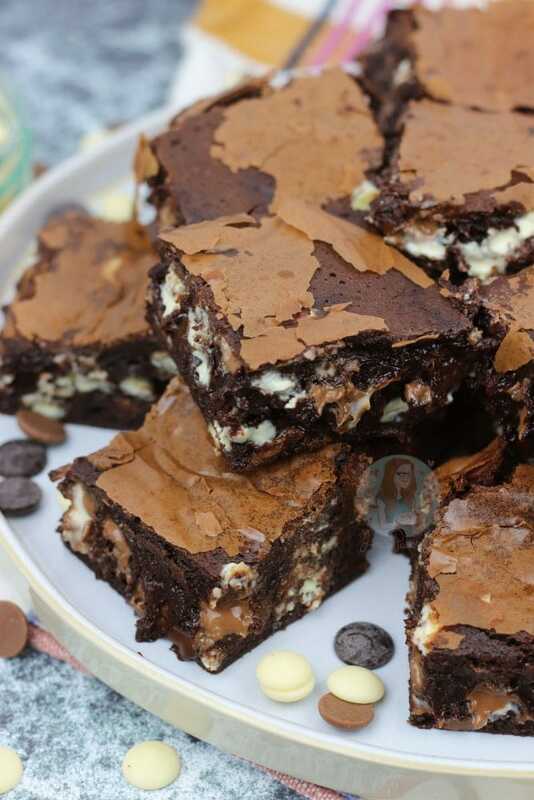 These Triple Chocolate Brownies will last in an airtight container for 1 week! Inspired by BBC Good Food recipe, but altered to my tastes. 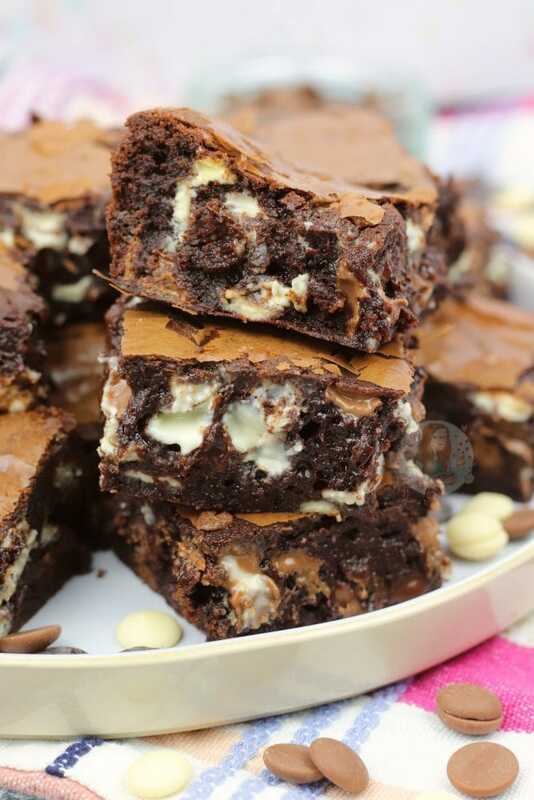 Find my other Brownies Recipes on my Recipes Page! Newer Previous post: Malteser Cookies! 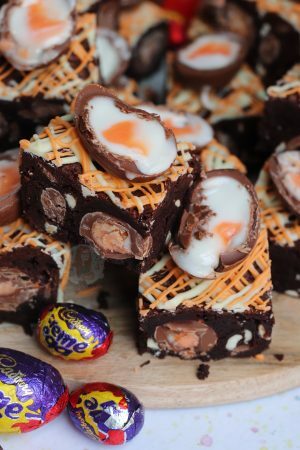 I am going to make brownies this weekend but with an easter twist, im going to top with chocolate cornflake cake mix. Will these be sturdy enough to hold that density on top do you think if i cook them a little longer or are they too gooey? Hi, these look soo good! I was wondering what would happen if I use a semi sweet chocolate with 51% cocoa instead of dark chocolate and just put less sugar? How much mess sugar do you reckon I would need? I wouldn’t advise messing with the recipe, to be honest… the darker the better for the baking, I use 70% minimum. And the sugar is used to make the mousse, so you need the full amount. 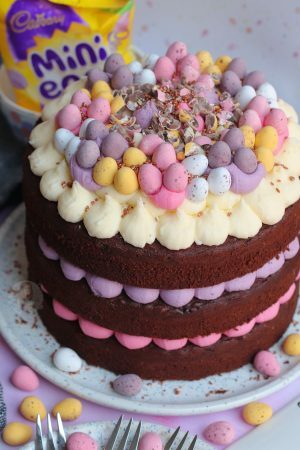 Is it possible to overmix the egg and sugar? I would say it’s quite hard… eventually it will always be possible. I leave my whisking and quite a high speed for a good few minutes and its fine! Just made these , they tasted amazing !! Was a bit unsure if I cooked them properly though because the middle and bottom of the brownie was wet/oily looking , they were in my over for 40 mins though . It might just be that it was a little thin when it went in, so it took a little longer! Another perfect, easy to follow recipe! Didn’t have a big enough tray but split it into two smaller ones and they came out fab! Love that the measurements for the chocolate are a round number, easy to buy without having random chunks leftover! (Hate dark chocolate so leftovers just get thrown away). The only problem I have with your blog, is having to decide which of your fab recipes to try next! This recipe looks absolutely exquisite!! I was just wondering, if I keep the brownies for a few day and heat them up when I want to have some (cause I love it warm with a cup of milk) will the chocolate chunks still be gooey and chewy ? 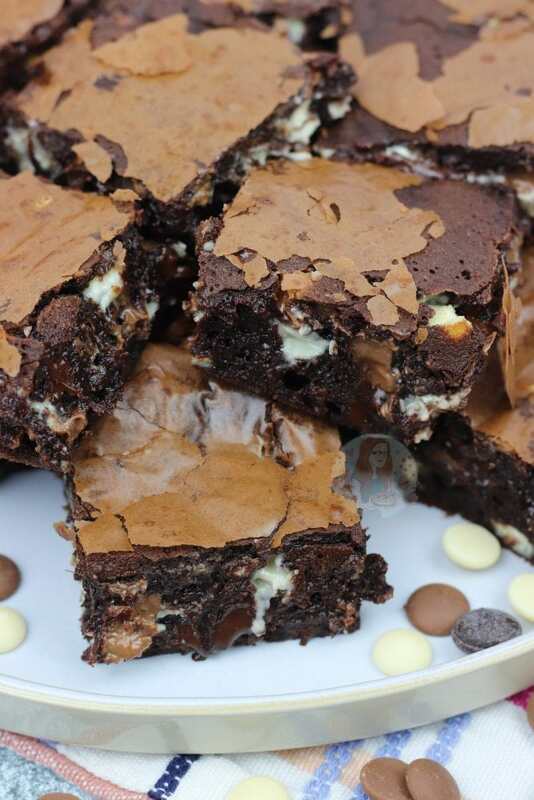 If the brownies were warmed again, the chocolate chunks will be gooey again! Hi, can these be turned into protein brownies?? If so what do i substitute? I’m afraid I have no idea as I don’t bake with protein. Hi Jane, these look delicious! 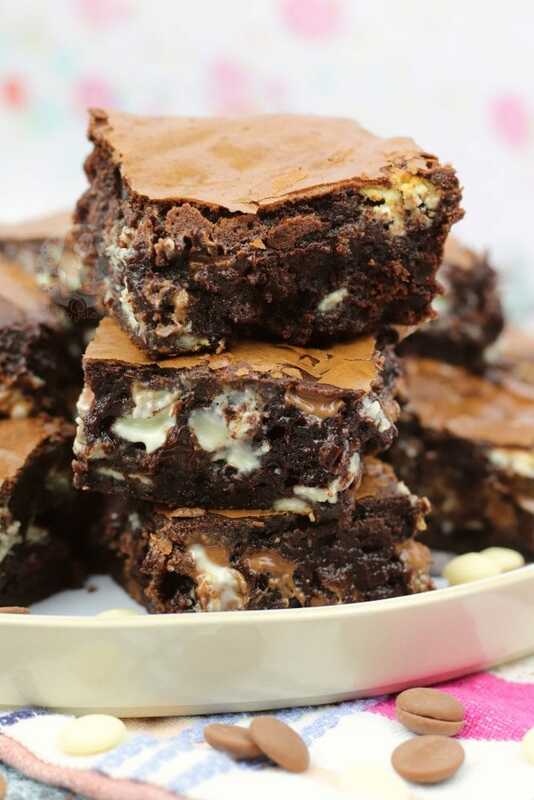 I want to make this recipe into a brownie pizza… am I right I’m thinking I would just need to go up a tin size, so to a 10” round tin and then I can keep the quantity the same? ‘ve tried them and they are delicious! Would it be able to make these gluten free? 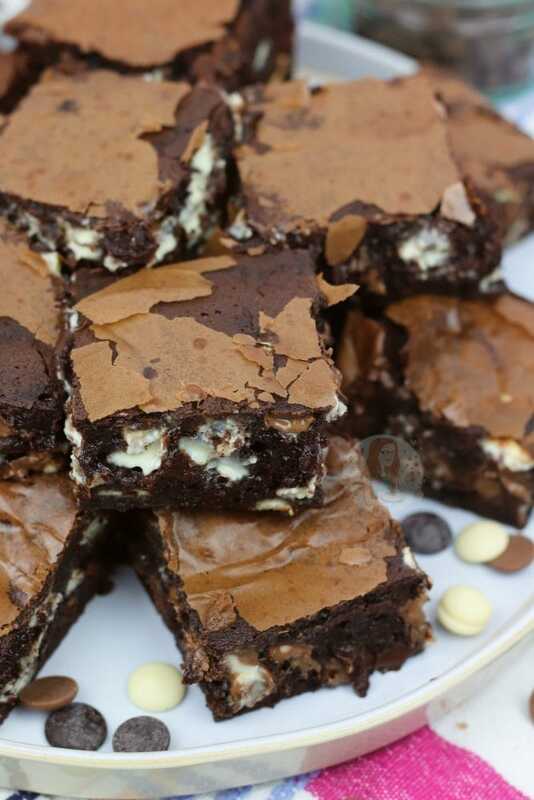 Please could you tell me what I would need to do instead to make them gluten free brownies? You can substitute the regular flour for a GF version (I recommend doves farm) and then add in another 35g on top. Can I use regular white sugar instead of caster sugar? Do you mean granulated sugar? I wouldn’t advise it personally as the granules are quite a bit bigger so it won’t whip the same. Do you think you could add chopped walnuts to this recipe? Yes, it would be yummy! Hi Jane. I adore your recipes and can’t wait to try these! Do you know if they are freezable? can i use salted butter instead? You can, but it’ll make them saltier. 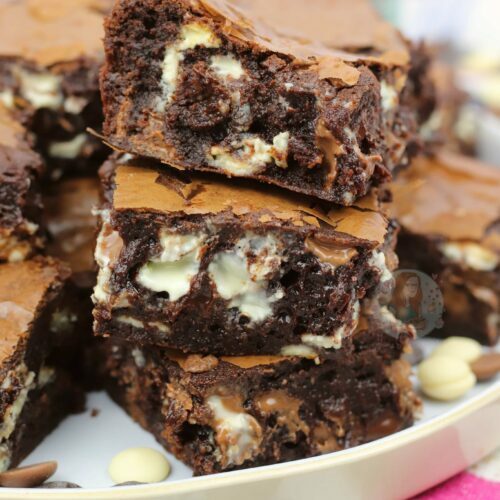 Hey Jane is it possible to make these brownies just regular chocolate brownies ? Do you mean without the chocolate chips inside them? Yes can I leave the white chocolate out and is unsalted butter necessary ? I’m a very big fan of your recipes! 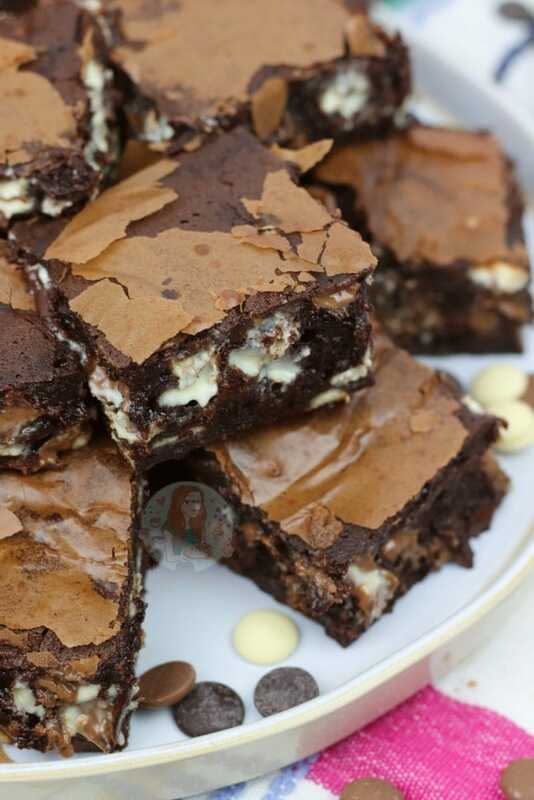 I love the look of the crunchy, flaking top on these brownies. My favorite kind of brownie. Yum! Thank you! And so good isn’t it.